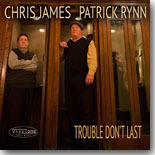 Southern California blues cats Chris James and Patrick Rynn have been performing together for 25 years, and their excellent collection of old school, stripped down blues is a worthy choice as this month's Pick Hit. Our Surprise pick this month features the wonderful Delmark CD, Slip Into A Dream, from former Lil' Ed associate Dave Weld. Our Flashback feature highlights a double-CD from the very influential yet little known D.C.-based sax player Joe Stanley, who passed away in 2007. Our What's New section features reviews of new CDs from Zach Harmon, Tommy Castro, Anthony Geraci, Laura Rain, Duke Robillard, John Mayall, Al Basile, Les Copeland, The Beat Daddys, Sam Butler, Colin Linden, Andy T - Nick Nixon Band, Mitch Woods, and many, many more. All contents Copyright © 2015, Blue Night Productions. All rights reserved.